Breast cancer is the most prevalent cancer among women worldwide. 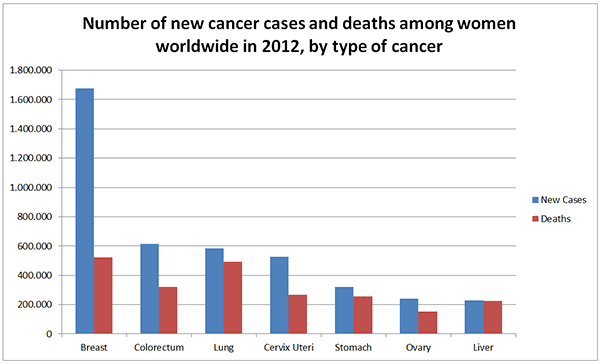 In 2012, nearly 1.7 million women were diagnosed with cancer. In spite of early diagnosis and medical treatments, breast cancer was the most lethal cancer among women in 2012 (about 520.000 women). For early diagnosis, the most common methods are mammography or breast ultrasound. However, these two methods have a much lower accuracy compared to magnetic resonance imaging (MRI) as numerous studies have demonstrated. In a study by Kuhl et al. (2010), 687 women have been examined annually between the years 2002 and 2007 using the above mentioned methods. In doing so, 27 women were diagnosed with breast cancer. MRI had the highest accuracy with 25 detected cancers (92.6 per cent). By using ultrasound, 10 cancers (37 per cent) have been identified and mammography detected only 9 cancers (33.3 per cent). Major drawbacks of the MRI are increased exam time and cost when compared to mammography or ultrasound. However, a study at the University Hospital of Aachen (Germany), carried out last year, could show that exam time may not be a factor. Kuhl et al. (2014) have performed MRI examinations for early diagnosis of breast cancer in three minutes. Thus, they achieved comparable exam times to mammography. As early as 1995, the General Manager of NORAS MRI products, Hubert Noras, started to develop a fixation unit and positioning system for MR-supported biopsies of the female breast. This system was patented under DE19626286C2 one year later. This unit was the first Post & Pillar Biopsy System that allows precise tissue samples in the MRI and that could allow visualization of the needle position during a confirmation scan. Further products for breast diagnostics and biopsies followed and have been continually developed to meet the current challenges in the field of MR-supported breast biopsy. Due to innovative development and close working relationships with clinical practitioners, NORAS MRI products continues to be one of the leading manufacturers of products for the MR-supported breast biopsy and imaging.